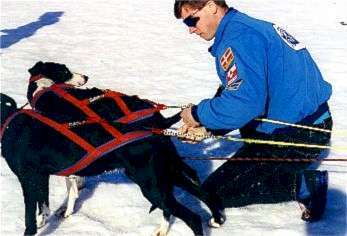 The 1998 Open North American Championship race was unusual in many respects: warm weather forced the race from 2nd Avenue to the ADMA race track; for the first time in ONAC history the third heat was shortened from 30 miles to 20 miles; and for the first time ever the winner came from outside of North America. Race fans also got a glimpse of the impressive pointer crosses developed in Sweden. Many experienced mushers believe these hounds will be the next wave of winning sled dogs. 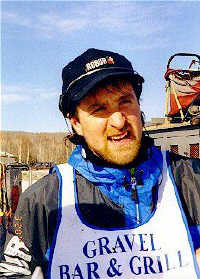 Rumor has it that Egil Ellis plans to return to Fairbanks next fall to train and race on the legendary Fairbanks trails. A special "thank you" to Lisa B. Fallgren Stevens for providing these photos . 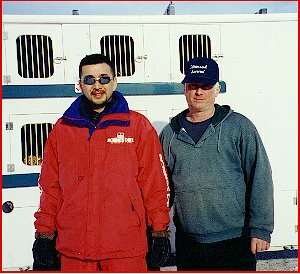 Michi Konno, Winner of the 1998 Open North American Championships with team owner, Joee Redington, Jr. Michi, from Sapporo, Japan, is the first musher from outside of North America to win the ONAC. 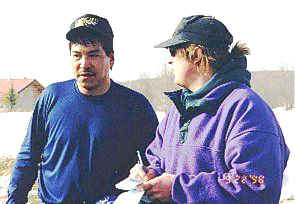 Curtis Erhart being interviewed by News Miner reporter/Quest musher, Tim Mowry, right after falling to 2nd place in the 1998 ONAC by 8 seconds. 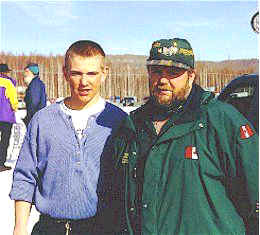 16 year old Buddy Streeper and Dad, Terry Streeper. Buddy finished 3rd in the ONAC--a remarkable accomplishment for a 16 year old! Arleigh Reynolds checking the temperature of one of Egil Ellis' dogs after a 20 mile run in unseasonably warm ONAC temperatures. Egil Ellis of Sweden finished 5th, missing 4th place by a mere 1/10th of a second. His pointer crosses (pictured above) created quite a stir--they turned in the 4th fastest time on Sunday, with only 7 dogs on the line.